A number of consistent design qualities have helped define Explorer over the past 29 years, and the design team strived to hold on to these important pieces of heritage. Longtime traits - including Explorer's blacked-out A-pillars and D-pillars and body-color C-pillars - are retained. Changes to the overall profile include a more sloping roofline and shorter front overhang, giving the vehicle a sportier, more stylish appearance. 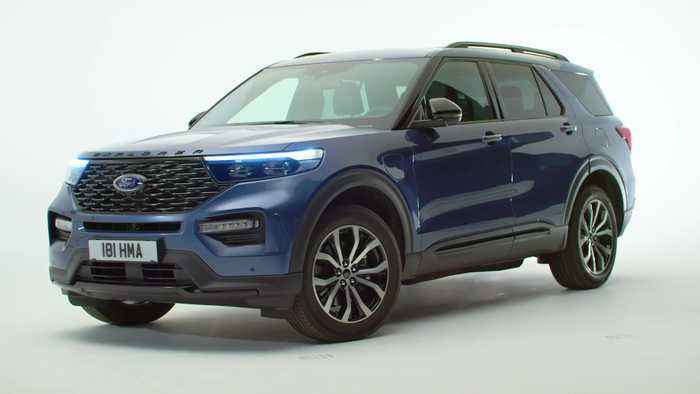 Ford Explorer comes standard with 18-inch painted aluminum wheels, but across the lineup drivers can opt for one of seven wheel designs, including 21-inch premium aluminum wheels available on Platinum models. Other Platinum differentiators include door handles with satin aluminum insert, liftgate appliqué, lower bodyside cladding insert, roof-rack side rails and a unique grille with satin aluminum finish. Platinum models also feature a standard twin-panel moonroof, which allows light to flood the most comfortable Explorer cabin ever. Explorer Platinum includes special leather seats, plus leather-wrapped steering wheel, dashboard, door rollovers, and door and front console armrests.